When atoms are allowed to interact things can get really interesting! Did you ever wonder metals are shiny, why some materials are magnetic while others are not, how electrical currents can flow forever without resistance and how nano machines and devices can be constructed remarkable quantum mechanical functionality? Master's students with their supervisor at the scanning probe microscope, Barth Lab. Photo: TUM/Regan. Condensed matter physics explores these questions and focuses on how the fundamental properties of materials can be tailored and controlled on the atomic, molecular and nanometre scale to control their macroscopic optical, electronic, mechanical, magnetic and thermal properties. Condensed matter physics is the study of nature, the study of materials using sophisticated small and large-scale instrumentation and the description of physical phenomena in materials at a theoretical level. A Master’s student in the Physics Department of TUM will embark on a tailored study program on advanced condensed matter physics, both from the perspectives of fundamentals and by exploring novel devices and applications. You will delve into the details of materials physics, to see how materials can be tailored at the atomic, molecular and nanometre scale using bottom-up and top-down nanofabrication methods to yield fascinating quantum phenomena that can be harnessed for novel technologies. You will study ultrafast processes occurring over attosecond and femtosecond timescales in atoms, molecules and hard and soft matter and will explore concepts and devices used in modern condensed matter physics. The Master's degree program in Physics (Condensed Matter Physics) is a two-year international graduate program designed to give students advanced insights into current research trends and new developments in condensed matter physics. including advanced statistical physics and solid-state theory, the study of correlation phenomena and magnetism, the study of electronic structure of solids, advanced experimental and theoretical semiconductor physics, semiconductor electronic and photonic devices, interface and surface physics, magnetism and magnonics at the nanoscale, quantum many body theory, spin physics and spin electronics, superconductivity and low temperature physics, topological insulators, graphene and two dimensional materials. 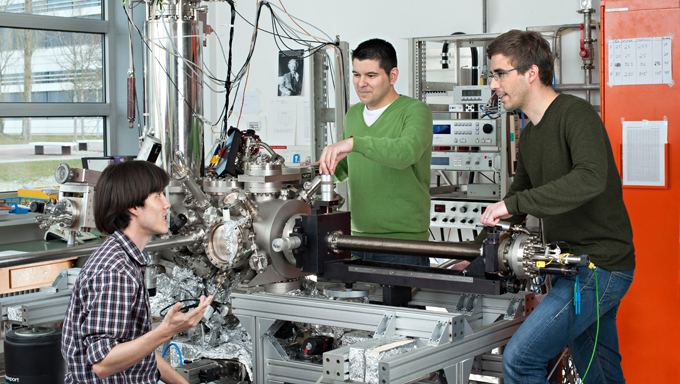 including topics as solid-state spectroscopy, physics with neutrons, modern x-ray physics, advanced materials analysis with synchrotron radiation, magnetic measurement methods and nanoscience using scanning probe techniques. including topics such as nanosystems, nanomaterials, nanostructured hard and soft materials, surface and nanoscale science. Special emphasis is placed on understanding advanced concepts relevant for nano-electronic and nano-photonic systems and devices. including topics as quantum optics, ultrafast physics and attosecond science, optics of nanostructured materials, plasmonics, nanostructured photonic media, the construction and use of coherent light sources from the infrared to X-rays, photonics devices, optoelectronics and the physics of ultra-cold quantum gases. including topics such as polymer physics, nanostructured soft materials. The curriculum of the Master program Physics (Condensed Matter Physics) follows the uniform structure of the Physics Master programs. Students receive advice on their individual curriculum and choices from the broad elective catalogs by a mentor. The study program of the first year of studies can be organized individually. The following study programs show examples of how the first year of the Master's degree program Physics (Condensed Matter Physics) could look like.